Why is it that your first electric guitar often tends to be your most forgettable? The only thing I remember about my first guitar was that it had strings like a cheese cutter and came with a beaten-up case. It took many years of trading and selling before I could finally afford my first decent electric. Charvel Guitars has found a way to break this dubious tradition with their new Desolation Guitar series, a line of entry-level electric solidbodies aimed squarely at rock and metal players on a budget. These guitars are so well made that you will keep and remember them long after you add subsequent axes to your arsenal. Recently I had the opportunity to try out two of the first models, the Desolation DS-1 ST and DS-2 ST single cutaway guitars. 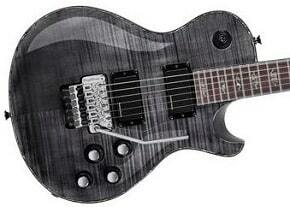 The Desolation series is amazing, providing options galore and incredible playability, all at a great price. These kids today—puh! They don’t know how easy they’ve got it! To fully appreciate the lineage of the Desolation guitar line, you have to know a little about Charvel history. Set the Wayback machine to the late 1970s, when Wayne Charvel starts up as the ultimate mod shop, catering to the likes of Eddie Van Halen, Warren DeMartini, and many other rock gods. Wayne was the go-to guy for these top players, who would have Dr. C. swap out necks, pickups, and anything else in an effort to carve out their individual sound. Charvel then broke out on his own and created iconic models for the instrumental metal movement, whose height was in the late ’80s and ’90s. Today, Charvel is part of Fender, but they continue to be the hot-rod of guitar makers, offering both standard production models and premium custom shop guitars. Amazingly, many of the people who worked with Charvel in the 1980s are still crafting guitars in Charvel’s custom shop today. The lineage of quality and pride in the craftsmanship continues. To bring the new guitarist to Charvel, the Desolation line offer a variety of options while keeping the sticker price low. First, you can choose a mahogany body style in single cutaway, double cutaway, or Skatecaster models. Each style offers a scalloped heel, allowing easy access to the upper regions of the fretboard (see Fig. 1). Fig. 1. The well-shaped heel facilitates quick position changes and speedy picking in all regions of the fingerboard. Then you can pick your colors, from flat black and white to transparent red, black, and blue stains on a flame maple top. I found the flat black especially nice, with its silky, stylishly classy look. Next, you select a neck style, from the low-cost bolt-on neck to the top-of-the-line neck-through models. Each of the necks are solid mahogany with a rosewood fretboard and beautiful abalone binding on the neck, body, and headstock. If that weren’t enough, the neck-through models offer the option of a Floyd Rose tremolo. To help further craft that high-end metal sound, the Desolation series uses active pickups on all models. At the high-end, with the Floyd Rose and neck-through models, you’ll find Seymour Duncan Blackout active pickups (AHB-1B and AHB-1N for bridge and neck, respectively), while other models sport either EMG 85/81 or Charvel’s own Custom Active Pickups (which appear on the entry-level single cutaway bolt-on model). My review model featuree the EMGs, and they provided all the low-end punch, midrange focus, and piercing, articulate highs these active p’ups are known for (see Fig. 2). Fig. 2. You have a choice of pickups when ordering your DS, including Seymour Duncan and EMG. Once you place high-gain guitar with an 85/81 combination, it’s hard to go back to passives. Another bonus: When they’re not supposed to be making noise (as in, when you’re not playing), the pickups are dead quiet. It’s not necessary to roll back the volume knob during the quiet passages. Just keep your hands lightly on the strings to mute them. As good as the pickups are, it’s in the neck department where the Desolations truly shine. According to Charvel, the one place that was critical in the development of the Desolation series was the neck. Well, it shows. All the Desolation necks use a hybrid, compound-radius design that start with a 12″ radius at the nut and gradually widen out to a 16″ radius at the 24th fret (see Fig. 3). Fig. 3. The fingerboard and neck radius make for a very fast, smooth feel. The first thing you notice is the weight of the guitar—not too heavy, but with enough heft to feel substantial and provide sustain. Then there’s the effortless playability. The neck on my DS-1 and 2 models were truly things of beauty. The hybrid factor means you can move seamlessly from open chords to passagework at the 17th fret and beyond. The profile is a thin D shape, which is ideal for doing fast single-note runs, precision two-handed tapping, and compound riff/lead work. Another plus is that the necks all have a smooth, natural finish that facilitates quick and friction-free left-hand movement. I truly wish the Desolation guitars were around when I was ready for my first guitar. I think I would have developed a lighter and faster touch, which was my dream at the time. The craftsmanship is flawless, the feel is awesome and the options are plentiful—a level of versatility that’s impressive at these price points. If you are starting out or watching your budget, but are still ready for a professional guitar that builds on decades of custom guitar expertise, rock out with the new line of Desolation guitars from Charvel.